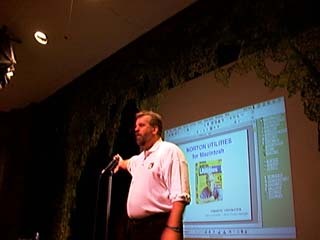 Between Symantec (showing Norton Utilities for Macintosh 4.0 and Norton Antivirus for Macintosh 5.0) and Apple (showing Mac OS 8.5, released the same day), there was something for everyone at the October 1998 General Meeting. 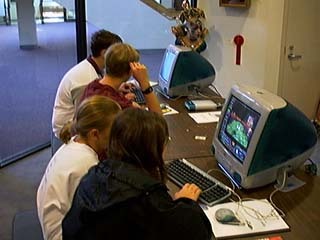 If this wasn't enough, one of the area's top all-Macintosh stores, MacUpgrades, was out in the lobby, selling iMacs and fresh copies of Mac OS 8.5. Apple also brought some iMacs for display, which attracted a sizable lobby crowd. Pi Vice President Don Essick outlines the day's activities and previews future offerings. J.D. 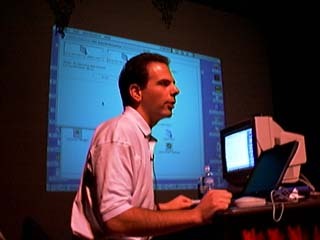 Mankovsky, an Apple Systems Engineer with a gift for making the technical not only interesting but exciting, outlines the future of Mac OS. J.D. 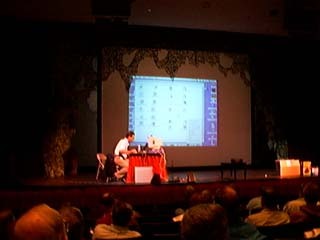 had, as he put it, enough material for several hours -- but slightly less than an hour for his presentation. If he looks intense as well as intent, it is with reason. Northern Virginia Community College was hosting an elaborate theatre production during this time, and decorations from the play added an interesting atmosphere to the Pi General Meeting. Some suggested the lacy decorations looked like Spanish Moss, giving everything a "Deep South" look. J.D. 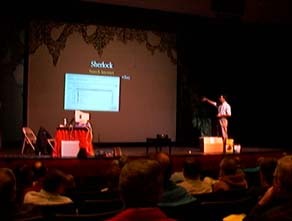 was particularly excited about Sherlock, the new search engine built in to Mac OS 8.5. Judging by the "oohs" and "aahs," everyone else was excited, too. 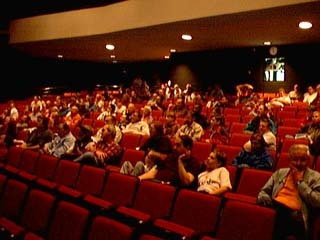 Just like church, nobody ever wants to sit in the front row. Unlike church, there is an almost good reason: the front edge of the stage, plus the equipment on the stage, tends to block the view. J.D. 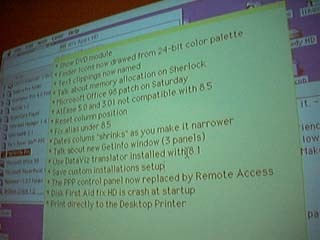 demonstrated an interesting use for Stickies: the main points he wanted to cover were written on Stickies, so in essence he was using Mac OS 8.5 as both a presentation tool and the subject of the presentation. 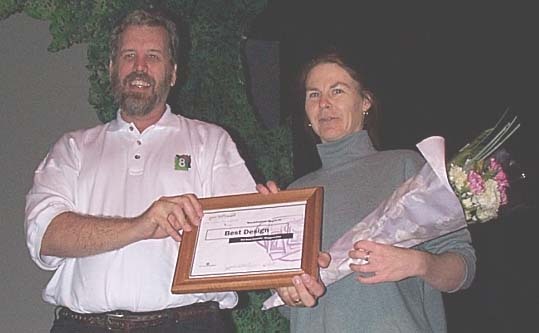 Once again, the Washington Apple Pi Journal took multiple awards in the latest 1998 User Group Newsletter Contest, the Intergalactic Awards, including Best Overall. Kathryn Murray, Journal editor, accepts one of the awards from Pi Vice President Don Essick. 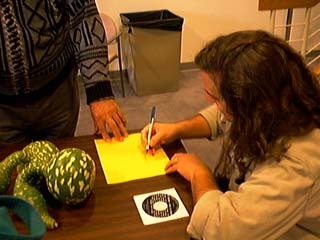 Photo by David Wood, taken with a Kodak DC210 camera. 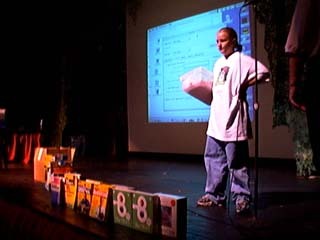 Dana Essick stands behind some of the huge number of door prizes given out at the October meeting. Dana Essick and her brother, David, check out an iMac in the lobby during the meeting. Do you think Dana has ever heard of the term "cheesecake photo?" 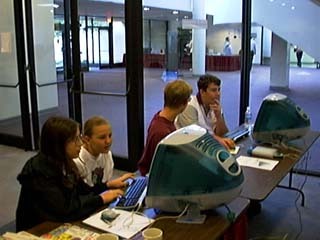 A constant stream of visitors tried out the two iMacs in the lobby. 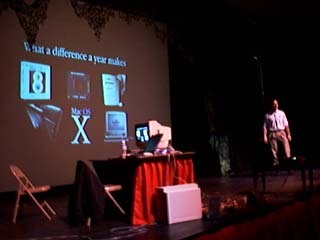 About the only negative comment heard about the iMac: "Why can't we get one now?" 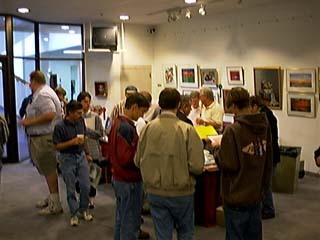 Following the meeting, the crowd stopped in the lobby to look at iMacs, buy copies of Pi Fillings: Version 4.0 or Pi Fillings: Goes to School, or buy copies of Mac OS 8.5, or buy an iMac.